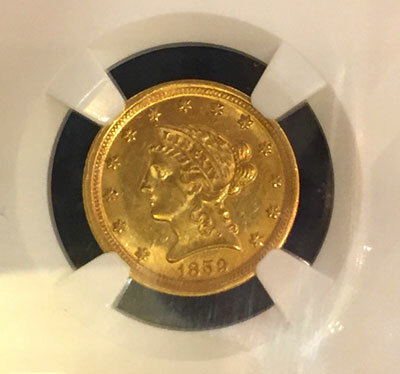 For the October Greater Atlanta Coin Show, lots of people visited the bourse full of dealers and their displays of coins, currency, bullion and collectibles. Here's a HUGE thank you to all of the people who helped make the October coin show a success - from the visitors to the dealers to security to the hotel's staff. Thank you one and all. As for the weather, well, fall was definitely in the air. The day was partly cloudy and not cold with temperatures in the 60s, but the air hinted at the cooler weather just ahead on the calendar. For October, the coin show shared the hotel with three, count 'em three, different weddings along with the normal church services held in other areas of the hotel's meeting spaces. But, the coin show's bourse was certainly busy. 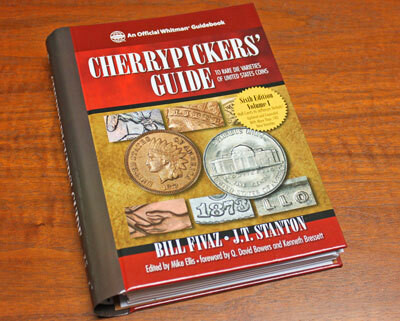 First, it's a book, a new version of a popular resource, The Cherrypickers' Guide to Rare Die Varieties of United States Coins, Sixth Edition, Volume I. Recognized as caused by a die clash between an obverse die and a reverse die, the impact of the eagle's wings on the reverse die generated a marking outside of Franklin's mouth, which according to some resembles buck teeth, or "Bugs Bunny" teeth. The first known specimen of the 1952 Proof 65 "Bugs Bunny" Franklin half dollar was sold at auction by Great Collections on August 16, 2015 for $5,250 ($5,775 with Buyer's Fee). 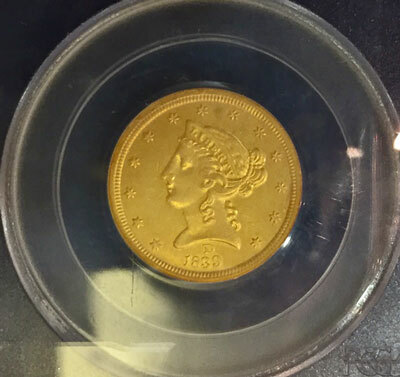 The second specimen at Sunday's coin show was also seen and sold. But no, we don't have the dealer's details on his sale at the show. Moving on, another dealer had two beautiful, almost white, silver Barber dimes also known as the Liberty Head dime. The front notes, "Half Cents to Jefferson Nickels! Updated and Expanded With More Than 140 New Varieties." This is an updated version of a great resource for those who like to search for and find the odd and interesting varieties of coins, especially those characteristics that have more value than the common varieties. Yes, there is another book, Volume II, that includes Half Dimes to Silver and Modern Dollars, Plus Gold Coins, Commemoratives and Bullion. But, for this month, the new version of Volume I had just been released. And, as some of you know, the two authors are located relatively nearby and can be seen at the monthly coin show, not every month, but fairly regularly. Next on the bourse in the odd and interesting category was an example of Mourning Jewelry. This one was a necklace with a gold locket. Definitely odd, this Mourning Jewelry included braided human hair for the chain. Some think the chain was made of the deceased's hair, but those who are familiar with Mourning Jewelry note that was not always the case. From Collector's Weekly: "The hair was not necessarily from the deceased-in the middle of the 19th century, 50 tons of human hair a year was imported into England for use by the country's jewelers. To create a connection to a deceased loved one, their initials were often discreetly woven into the object." Lockets on the necklace of woven hair could contain a lock of the deceased's hair or a small photo of the deceased. Whether of the deceased's hair or not, the Mourning Jewelry necklace provided a view into Victorian era history. Third on our list around the bourse was a "Bugs Bunny" half dollar. This one, a PCGS PRF65 1952 Franklin Half Dollar is believed to be only the second known specimen of that year and grade. "What is a 'Bugs Bunny' half dollar?" some of you might ask. The "Bugs Bunny" half dollar was previously found on circulation coins and predominantly on the 1955 Franklin halves. One was an 1895 version, and the second was an 1899 example. Both were graded by NGC as Proof 65. From the Red Book, the US Mint struck only 880 of the 1895 and only 846 of the 1899 proof dimes. In other words, only a few of these coins exist and even less in the Proof 65 grade. 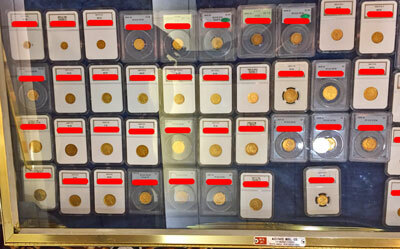 Last for our list this month are gold, gold and more gold coins from the Dahlonega and New Orleans mints. First, no, the dealer did not have red stickers on every holder. Those red rounded rectangles were added to the pictures to prevent some nefarious use of the certification numbers. So, what were all these gold coins? There was a complete set of New Orleans gold $1, $2.50 and $3 coins. 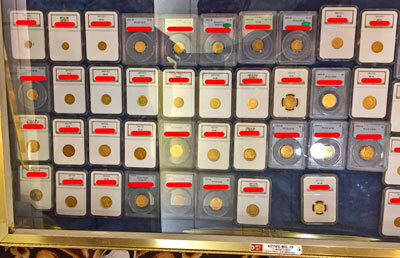 Next, there were 38 different Dahlonega gold coins including several Half Eagle ($5) coins. Here are two examples from all of the gold in the three showcases. The first version is an 1859 Dahlonega Quarter Eagle ($2.50) graded as MS-60 by NGC. Of course, the October bourse with its many dealers offered many more different coins, currency, bullion and collectibles for the viewing, buying and trading pleasure of the visitors. Also, the dealers discussed collectibles and offered their free, verbal appraisals for people that brought their items for evaluation. And, some chose to sell their items while others decided to keep their collectibles for awhile longer. Next month, the dealers will again pack the bourse with their displays full of similar items along with newly found collectibles that they obtain between the monthly shows. 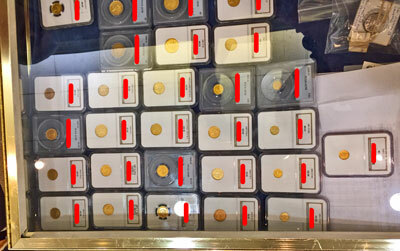 Visitors are always welcome and admission is always free to browse, buy, sell and trade coins, bullion, currency and related collectibles with the dealers at the Greater Atlanta Coin Show. Mark your calendars for the next Greater Atlanta Coin Show on Sunday, November 15, 2015 in the Joe Mack Wilson Ballroom.